A new study by an ed-tech management company identifies the 40 most popular digital learning tools, accessed via Google’s Chrome browser, that are used in K-12 schools. The study—conducted by Lea(r)n Inc., a company that operates a management system that organizes, streamlines, and analyzes ed-tech utilization—found that the top three tech products accessed in schools via Google’s Chrome browser are Google Docs, YouTube, and Google Drive. The most-often used learning management system was Canvas—the fourth most popular tool on the list—two places ahead of Google Classroom, which is also classified as an LMS, according to the analysis. 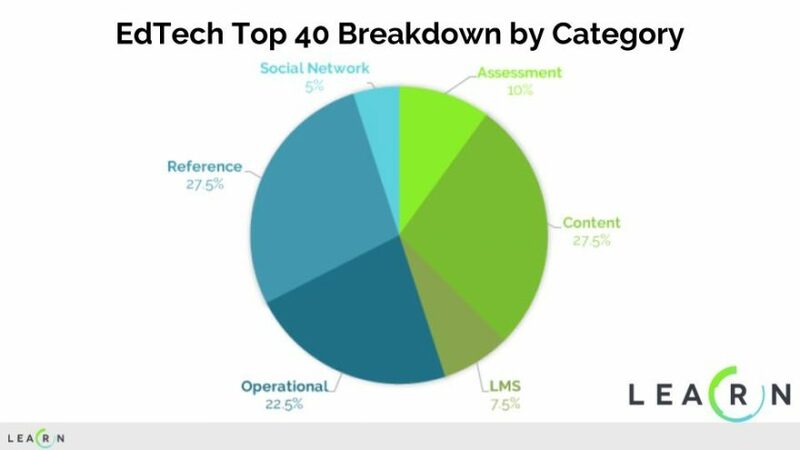 The only other LMS on the list was McGraw-Hill Connect, which was the 40th most-accessed tool. “If we want to understand what [products] work for students and teachers, we have to first understand what’s being used,” said Karl Rectanus, CEO and co-founder of the company that conducted the analysis of 440 million data points and 2,028 ed-tech products used in schools over the first nine months of 2017. The analysis showed that half of the time schools access ed-tech tools is for operational purposes—to use gradebooks or communicate with parents, for example—or for research and data-gathering via online databases, dictionaries, or news sites. Social media uses only comprise about 5 percent of access, he said. The Ed-Tech Top 40 study was based on more than 200 U.S. schools and districts. Lea(r)n operates LearnPlatform, a management system that organizes, streamlines, and analyzes ed-tech utilization. The company classifies products according to how they are used: assessment, content, learning management system, operational, reference, and social network. Kahoot! led the “assessment” category, as the fifth-most-popular tool overall, above Quizlet (#9), SchoolCity (#10) and Schoolnet (#17). The highest-ranked content tool was YouTube (#2), with ABCya!—at #22—its closest competition in that category. Khan Academy was 25th. The leading social network sites accessed were Pinterest (#11) and Facebook (#18.) Wikipedia was the top reference tool (#7), followed by Dictionary.com (#13) and Yahoo! Kids Encyclopedia (#16). Rectanus said 80 to 85 percent of the web traffic in K-12 educational institutions that were part of the study accessed the web via Chrome. Lea(r)n will integrate information from other sources and browsers in future updates to the “Top 40” listing, which he plans to repeat quarterly in 2018, Rectanus said. In a webinar about the analysis, Daniel Stanhope, Lea(R)n’s senior research officer, emphasized some important points about the study. He said the data do not represent an evaluation of impact or effectiveness of these products; the results could not be influenced by advertising, paid sponsorship, or by the companies listed; and the ranking is not meant to reflect how much time a person spent using a specific product. Lea(r)n doesn’t even consider the most important use of educational software, enabling individualized instruction. This is because most teachers are unwilling to make the effort to engage in their own re-education, and because most schools of education faculties have no idea of how to prepare teachers to use such software. Unless, this changes soon, then, combined with contemporary parental stinginess and nonparticipation in their children’s education, America will stay on the road to becoming the worst educated nation in the industrialized world. Mr. Levitt, I empathize with the frustration and anger in your text. I don’t know what you mean about parental stinginess, but as far as parental non-participation goes, I disagree with putting the blame on parents. I live in Southern California. The minimum wage here is $11 an hour. A cheap one bedroom apartment is at least $1100 a month. With two parents working just to survive, or one single parent working two or three jobs it seems clear that parents can’t be expected to participate in kids education. Teachers with their fully insured families and steady paycheck should be ashamed of themselves for strapping kids down with homework and expecting parents to be involved in school. The reality of their students lives is invisible to such well fed full time teachers. Lea(r)n doesn’t even consider the most important use of educational software, enabling individualized instruction. This is because most teachers are unwilling to make the effort to engage in their own re-education, and because most schools of education faculties are not capable of preparing teachers to use such software. Unless this changes soon, then, combined with contemporary parental stinginess and nonparticipation in their children’s education, America will stay on the road to becoming the worst educated nation in the industrialized world. Hey Michele, The study was so detailed and informative! I use most of these apps in my classroom. I feel there are some more apps which have been missed out in your list which is commonly used. One such free app you should check out is Animaker Edify – https://edify.animaker.com/ can be accessed via Chrome browser and a safe platform for teachers and students. Teachers like me use it for flipped classroom. Instead of just ordinary videos I create animated videos within minutes using this platform and best part is I can share it with my students once it’s done. During class hours I divide them into groups using Edify and assign creative tasks where they create animated videos, infographics based on their learning using the platform. This platform just integrated creativity with my curriculum and the results were amazing. Classroom management features helped me kept a track of my students and it also promoted collaboration among students. Such an informative blog! I’ve used few of these apps in my classroom and they’ve proved to be very helpful.